Our wedding consultations are in person with the Bride and are provided at no charge. We will sit with you and collaborate together on your wedding flower vision. We will go over your wishes for your bridal bouquet, reception centerpieces, boutonnieres, corsages, altar flowers, aisle flowers and cake flowers. We will also offer suggestions in flower choices and design styles to compliment your ideas. We are always trendwatching. Once you have booked your wedding with us. We will provide you with flower samples of each of the wedding flowers you chose. We know that seeing them in person will benefit you and help you rest assured that you made the right flower choices. Yes you can make changes. On-time and ahead of schedule is how we like to do it. We will deliver and set up your flowers on your wedding day and make sure every detail is in order. We will also transfer your ceremony to the reception if needed and when the partying is over we will pick up the rentals. Leave the worrying and details to us.. Wedding plans change, and so do your desires when it comes to wedding flowers. We will be there for you around-the-clock to ensure that you have the adequate amount of flowers. Need to add a table to the reception or something special to the ceremony, we will be there with you every step of the way. 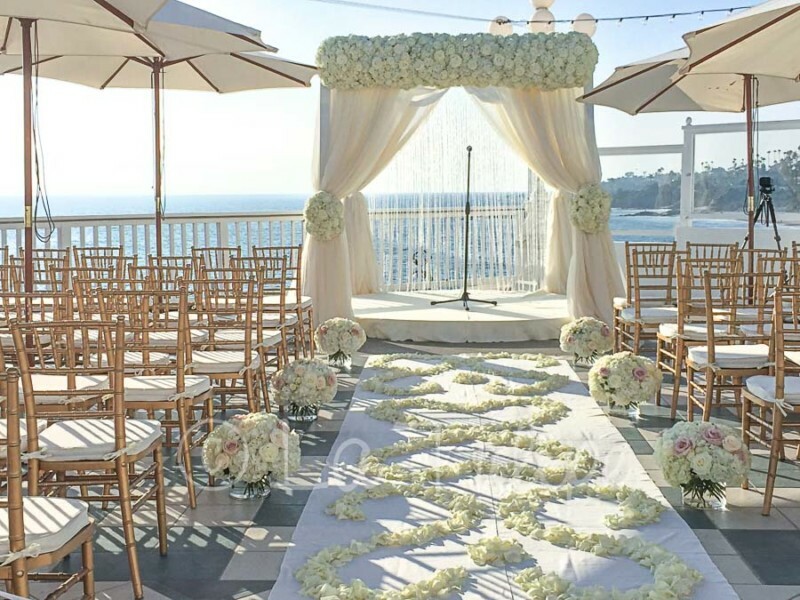 If you’re planning on a special way to say “I do” whether standing on the sand in Laguna Beach or overlooking the Ocean in Dana Point surrounded by family and friends, a destination wedding is a memorable way to tie the knot. We have worked with hundreds of brides planning a destination wedding. We provide wedding and reception flowers for all locations in Orange County, San Diego, Los Angeles, Temecula and the Inland Empire. We pride ourselves on exceeding each brides expectations. Our designers are experienced, loyal and dedicated to our customers. We have the experience and staff to handle any size wedding at Huntington Harbour Bay Club. Large or intimate weddings receive equal amounts of care when being prepared. All of our flowers are hand chosen for freshness and stored in our commercial grade cooler to ensure they remain as fresh as the day the were cut. Because every one of our brides are equally important, our professional staff is dedicated to making your Huntington Harbour Bay Club wedding experience a pleasant & memorable one. Annie creates a unique experience for her clients who are getting married at Huntington Harbour Bay Club. By working very closely offering guidance, expertise and style advice from the initial consultation to the actual wedding day. She understands each bride has a unique vision and style and will personally attend to your wedding flower dreams to insure your wedding day is an amazing memory to be cherished for a lifetime. Annie has the experience to give you that peace of mind you expect from an accomplished wedding flower specialist. We know this is your big day and we want you to be stress free.